Home Off Beat	Wisdom sprinkling tattoo: Where do you stand? 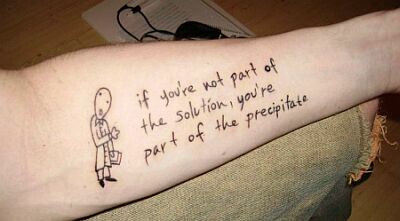 ‘If you’re not part of the solution, you’re part of the precipitate’, this is what this tattoo speaks and in fact, it is true. I would not try to decode the essence of this remarkable line, as those part of the solution will easily dissolve in it and those cooling their heels down with the precipitate too will grab the heart of it. Therefore, simply judge where you lie; better be a part of the solution.